This collection contains: the uncut version of the interview of Marion Finkels-Kreith by Beret Strong, 2013 ; the uncut version of the interview of Felicia Rosshandler by Judy Kreith, 2015 ; the transcript of both interviews ; the published memoires of Felicia Rosshandler ; an interview with Judy Kreith and Robin Truesdale on the film’s creation process conducted by Kazerne Dossin, 2019 ; an administrative file on the organisation of the screening at UGC Antwerp, 27 January 2019 ; a research report on the wartime and post-war migration of Jews from Antwerp by dr. Veerle Vanden Daelen conducted upon request of the Red Star Line museum, 2015. ROSSHANDLER Felicia, Passing through Havana. A novel of a Wartime Girlhood in the Caribbean, New York, 1975. Two copies of Cuba's Forgotten Jewels (Blu-ray) are part of the Kazerne Dossin video collection. Felicia Rosshandler's memoires are part of the Kazerne Dossin library. The Marion Finkels-Kreith collection (KD_00526) contains more information regarding Marion’s family fleeing to Havana, Cuba. See also the Fischler-Hollander collection (KD_00315) for more information on refugee Abraham Aron alias Bram Fischler in Portugal and Cuba during the war. Judy Kreith, a professional dance educator and choreographer, had always been inspired by the story of her mother Marion Finkels-Kreith. Marion and her family fled Belgium in 1941 and survived the war in Havana, Cuba, as members of the local diamond workers refugee community. In 2013 Judy set out to record her mother’s story. She contacted professional documentary filmmaker Robin Truesdale to conduct the interview. This first contact led to the idea of making a documentary film on the community of Jewish refugees in Havana, Cuba during the war. After visiting the Red Star Line museum in Antwerp the curator introduced them to Felicia Rosshandler who would become the second survivor to be included in the project. Judy and Robin subsequently contacted the survivors accessible to them in the Denver area: Marion Frolich and Lilliane Shuman. Ms. Frolich was unfortunately too ill to do an on-camera interview, but the filmmakers were able to access her interview recorded by the USC Shoah Foundation in 1995. Clips form this interview appear in the film. In 2015 Judy and Robin also travelled to New York to interview Felicia Rosshandler and Richard Grosbard, son of survivor Jacques Grosbard. Extensive research lies at the bases of the documentary. Additional materials were gathered to illustrate the survivors’ story. Judy and Robin visited archives in both Cuba and the United States, including the Leo Baeck Institute, YIVO, and the American Jewish Joint Distribution Committee in New York, while they also had access to the personal archives of the survivors. Their personal items included the memoires of the late Erich Jacobs made available by his daughter and read for the documentary by Holocaust survivor William Safran, the diary entries of Marion Finkels and Felicia Rosshandler’s extensive photo album. In 2015, Judy and Robin travelled to Havana together to develop a feel with the atmosphere of the city and to reflect on the direction of the documentary. 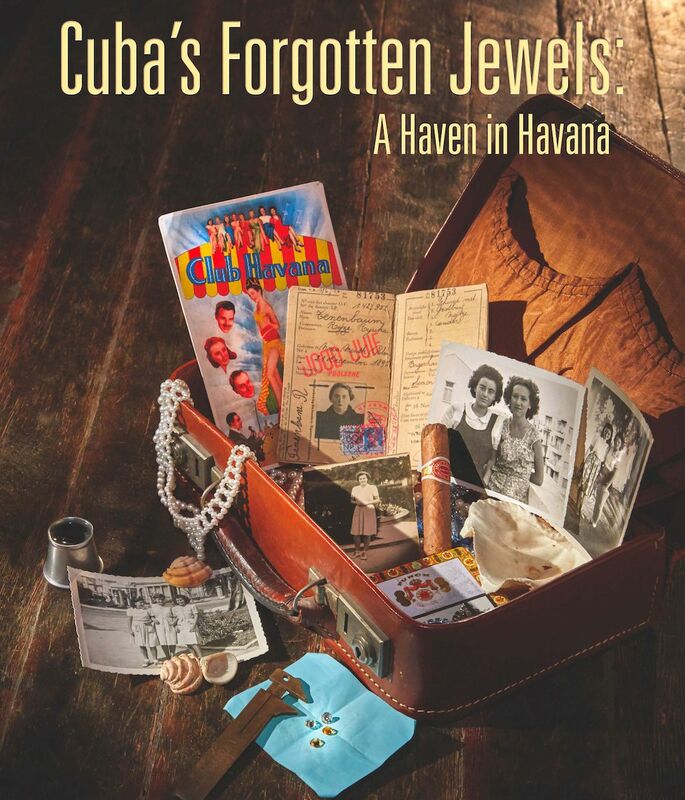 When working on the first version of the film, Judy and Robin decided to focus on the historical aspects of the diamond workers refugee community in Havana, Cuba and subsequently selected the materials most related to this topic. The rough cut was screened in Boulder, Colorado for a public audience after which Robin adapted the 45-minute documentary based on the audience’s feedback. The preview version of the film premiered in Alaska in February 2017, and in Boulder at the Jewish Film Festival in March 2017. The National Center for Jewish Film began formally distributing the film in August 2017. It continues to be shown on film festivals, with the NCJF holding worldwide distribution rights. On 27 January 2019, Holocaust Remembrance Day, Cuba's Forgotten Jewels was screened for the first time in Europe at UGC Antwerp, Belgium. In addition to the screening, documentary film makers Judy Kreith and Robin Truesdale entrusted several items related to the documentary to Kazerne Dossin. Both producers were also interviewed during their visit to collect information on the creation process of the film.